I decided to start blogging about projects in process instead of only posting finished things. 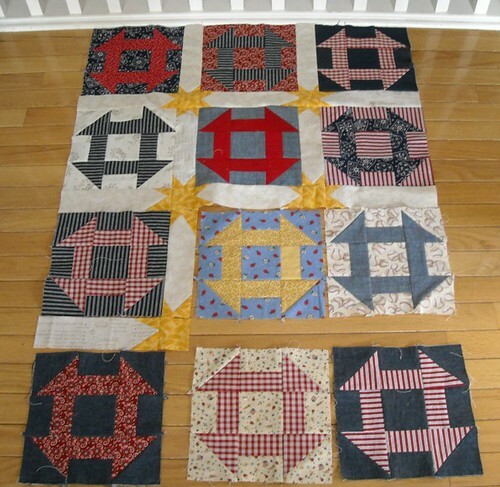 I'm working on this churn dash quilt for the Mountain Baby Blankets project. I sewed up the last 4 blocks for it yesterday and then decided to try the stars in the sashing last night while I was falling asleep. I like it! I was hoping to finish getting the top together today, but I have a baby, and I haven't slept all that well for the last 3 nights, and I have dishes and laundry to do and all that stuff. So it's not done yet. But it's getting there. I'm going to do some fun piecing for the back, too. I started block 2 for the Geese in the Forest block of the month project. There are 27 of this month's block in the finished quilt. I have one done (orange!) and 2 more in process for now. this will be great. i got a letter from them today that they received my quilts. quite a good feeling. I found your blog on a whim...it's great! I read your free-motion quilting guide and I'm having some trouble getting the thread tension just right. The top thread shows quite a bit on the back. I have adjusted the tension as high as it will go....what am I doing wrong?